A. A. Mubark/ Special greeting to All of U, M/S M. Yousaf, Asad Hasan, Farooq Khattak and Khalid Riaz after issuing of notification of upgradation in favour of u. Please also pray for us, so the notification of our upgradation may also be notify by the authority concern. A/A/KHALID ,ap ko meri taraf se buhat buhat mubarak ho,ab hamare lye bhee dua karna k sindh men bhee yeh impliment ho jaye. HAMARI TARIF SAY TAMAM AG OFFICE PESHAWAR KAY PS,STENOGRAPHERS KO DILI MUBARK BAD,AUR KHAS MUBARK HAM APNAY HERO MR.KAHLID RIAZ SUHAIB KO JIN KI STRUGGLE SAY YAY DIN DEKINA NASEEB HOUA HAY. 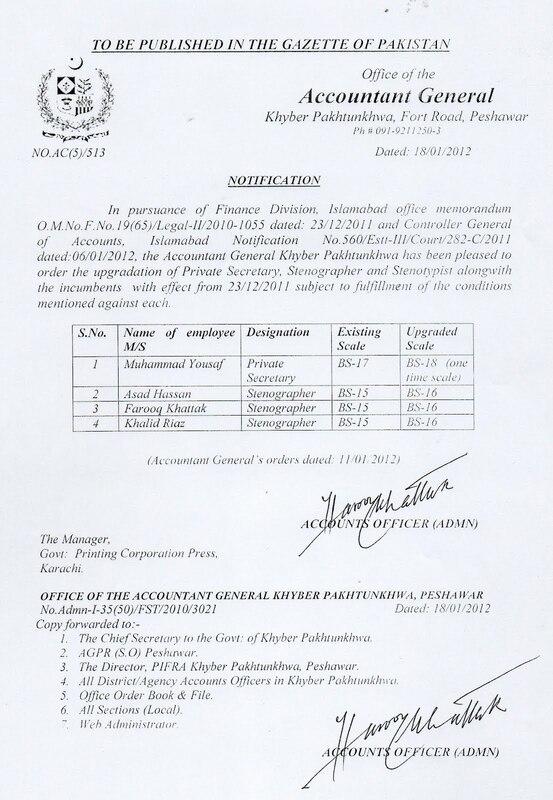 Kisi k pas sindh ki koi khabar ho tu bataye about notification by sindh govt for upgradation of stenographer? Many many heartiest congratulations from my and all my fellows in POFs. This indeed a landmark achievement. I have to clarify one thing which is creating doubts in our minds, we have learned from some source that Stenographer BS-16 will not be treated as gazetted and will not be given right to attest educational certificates, etc as people in BS-16 already are doing. Can it be so? What is the legal/rule position, someone please told me.